Agriculture depends on healthy ecosystems to provide services that include nutrient and waste recycling, pollination from insects, sediment control, and clean water. The Ecologically Sustainable Agriculture Initiative (ESAI) within the former Department of Natural Resources and Environment (NRE) consisted of eighteen projects about farming for the future and explored new ways of protecting the environment while maintaining economic viability. The projects were aimed at encouraging productive and sustainable agriculture and a number of these focused on biodiversity in agriculture. Links to some of the outputs from these projects are provided from this page. 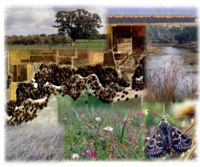 Up-to-date information related to Biodiversity in Victoria is available on the Department of Environment, Land, Water and Planning (DELWP) website. This website provides access to the Victorian Biodiversity Atlas and the new biodiversity strategy called Protecting Victoria's Environment - Biodiversity 2036. Access is also provided to Biodiversity information tools related to native vegetation assessment. Land for Wildlife Notes - information about managing bushland, natural regeneration, pest plants and animals, wildlife habitats, threats to wildlife habitats, and wildlife in farm planning. A downloadable copy of a Discussion paper on Biodiversity in Agriculture and Agroforestry is available on the Rural Industries Research and Development Corporation (RIRDC) website. The publication: Biodiversity in the Paddock: a Land Managers Guide is a new CSIRO Sustainable Ecosystems handbook on sustainability of native pastures. It is designed as a practical field guide to help graziers and land managers achieve biodiversity outcomes alongside the utilisation of native pastures. This publication can be downloaded from the CSIRO website.